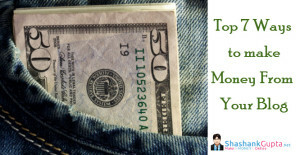 In last part we had a look at the top 7 ways to make money from your blog. 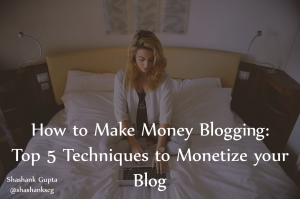 Hopefully you have found the best way to monetize your blog. However as I mentioned in the last post do not rely on one monetization option only. Diversifying is the key to making steady income from your blog. In this part we will be looking at how to build email list for your blog. While all other monetization options work well, the best way to make money from your blog is building a good quality email list. A list of subscribers who are interested in your blog and your content, and who trust you; offers very powerful money making potential. Why you need a Email Subscriber list? When you browse through my blog you will notice that I have RSS feed on my blog, which readers can subscribe to in order to receive my post updates. But that is not the only option I offer my readers, I also offer email subscription, which readers can opt in for. Infact if you notice I really encourage readers like you to subscribe to my email list. RSS is not my focus. Why is this? To understand why I encourage readers to subscribe to my email list, lets have a look at how RSS compares against Email List. Personalization Can add name, create segment and send mails accordingly. Choose different themes for different subscribers. RSS offers limited personalization options. Tracking Email enables tracking of many different metrics, from open rate to CTR etc RSS does not offer comprehensive and link by link tracking like email. Freedom to communicate Email allows anytime communication. You can set your own email schedule. RSS communication can only be done when a new post in added on the blog/website. Promoting Products Email offers tremendous flexibility to promote products. Emails can be sent independent of post, and can be formatted and designed in order to increase effectiveness. RSS offers very limited promotion opportunity. 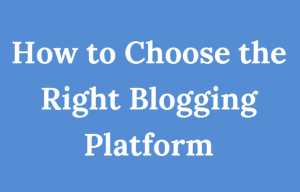 You have to post on your blog, only then RSS can reach out to your audience. Also there are no designing/formatting options like email. Reading Options Email can easily be read in browser RSS requires special RSS reader for reading. Sharing Options Emails can be forwarded and shared with other mail contact. It allows people who are hesitant to use or prefer not to use social media also to share the content and spread word about it. RSS cannot be forwarded. Social sharing is the only option for this. Makes you wonder why I use RSS at all? Because RSS is older, and many readers still find it more comfortable way of staying updated about my blog. So RSS stays. Lets move on and see how you can create a email subscribers list for your blog. Add email subscription forms on your blog, by filling which readers will be able to subscribe to your blog. These forms are more popularly known as the ‘Optin forms'. These Optin forms, form the basis of your entire Subscriber list building exercise. Design and placement of your Optin forms is of paramount importance. I have covered them more in detail ahead. Step 2: Why Should I subscribe? You are asking reader to give you something (email), to make this a simple choice for the reader, explain well why the reader should subscribe to you? What can you offer the reader? How can you help them. The better explaining you do the faster your reader will be convinced and fill in your optin form. You want something, you offer something. Call it by any name bribe, incentive, freebie or a barter trade off, end goal is to encourage readers to part with their email Id. Most popularly used incentive are ebooks, pdf reports, white paper, strategies etc. E-course, webinar, podcast are other freebie options you can look at. Do keep in mind that offering freebie might bring in poor quality subscribers, who have just subscribed in order to get the freebie and will unsubscribe later. To minimize this, choose your Optin form’s wordings with care so that your viewers know that apart from the freebie, they will be receiving more emails/updates from you in future. When offering Freebie monitor the CTR and open rate of the mailers sent to these subscribers closely, in order to determine the quality of the subscribers you get through these Optin’s. You can use different channels like social media, paid advertising, guest blogging etc, to encourage readers to subscribe to your blog. Use all avenues to promote your blogs subscription page. For readers coming in from these different channels, create a dedicated landing page. Design and format this page to effectively encourage your readers to subscribe to your email list. 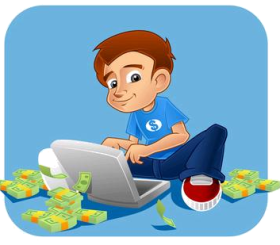 Leave no stone unturned in your quest to gain more subscribers. Facebook offers integration of subscription button on its pages. Utilize this. Make it easier for your Facebook fans to subscribe to your blog. Add link for it to your pdf downloads, in ebooks, videos, guest post. Everywhere. The more channels you use, the more subscribers you can gain. SEO brings in free traffic. 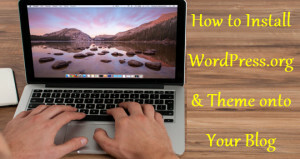 Learn it implement it and make it work for your blog. More traffic = more subscribers. Run competition on your blog, explain readers that by participating in the competition they will also be subscribing to your blog for future updates. Dont forget to giveaway prizes to the winners. Add pop up subscription form to your blog. Jury is divided on whether pop up work or hurt your blog. I find them to work well for my blog, you can test it out for your blog. But do give it a try. Create Quality content, over and over again. This will get you subscribers and make them stick too. Make sure your website is mobile responsive, but do not forget to make your Optin forms mobile responsive as well. Most optin forms, especially the pop up variety are not mobile responsive and they cause considerable frustration to mobile users. Give every viewer at least 2-3 opportunities to subscribe on every page via different optin forms. Different options, will encourage different users to subscribe to your blog. Broadly Optin forms can be classified into 4 types. ideally your blog should use a mix of all these 4 types in order to maximize the subscriber signup rate. However new bloggers might choose to work with ½ types of form only, develop their prowess with them and then move onto the more complex forms. Traditional Form: These optin forms are most commonly used, and can be found across almost all blogs. These forms rely on styling and design to grab user attention, and encourage sign-up to your subscriber list. Traditional forms are generally placed within the content and in the menu bars of the blog. These forms are easy to handle and a good place for new bloggers to start with. Major drawback with these forms is that they are poor at attracting attention of users. Pop up Form: Giving the traditional forms a twist are pop-up forms. These optin forms are designed to pop-up upon unsuspecting users and grab their attention. Such pop-ups force the user to pay attention to and acknowledge the sign-up form. This increases the chances of user-sign up. Drawback with these forms is that they can hamper user experience to certain extent. This can result in disgruntled user, and affect your blog traffic as a whole. Hence working with these forms requires a good understanding of your user’s behaviour, in order to minimize his/her angst on being interrupted with a pop-up. Feature Box: These are nifty new type of form, that are being used by the more experienced bloggers. These forms are placed at the beginning of the blog, and usually occupy the entire space above the fold on the blog on which they are placed. This attracts user attention towards these forms and ensures that these forms have higher sign up rate. PlugMatter offers best Feature box creation tools. Lead magnet: These are the powerhouse of optin forms. They are used by all leading bloggers and offer the best subscriber sign-up rate. These forms work by offering exclusive content to your audience for signing up. Exclusive content can be in form of pdf, files, software, ebook anything. The only requirement is that it should add value to your current content. Should sound and be useful for your audience. LeadPages is the most commonly used software for this purpose. A optin form is like an advertisement, you need to design it right to make it stand out, yet not be a eyesore. Make sure it contains neither too much nor too less text. Choosing the right font, color, all the small elements that go into making a form that looks so inviting that it will tempt users to sign up right away. So lets look at some Optin form designing tips, so that you can design the perfect form for your blog. Test your optin for different font size, style & color. Different presentation works for different blogs. When deciding the color scheme for your form, create some forms with color scheme that's in tune with the colors of your blog/logo. at same time design some forms with colors that contrast your current blog color scheme. Test both for effectiveness. Keep away from flowery and cursive font. Generally clear fonts like ‘Sans Serif' , ‘Times New Roman' etc work best. Add a image to the form, but keep it relevant. In case you are offering some freebie, add a image of the same. Keep form minimalistic. Do not include too many field for readers to fill in. Email address is the critical element. If you are high on personalization, ask for first name as well, otherwise stick to email address only. Create variation of your optin form content. Give readers different reasons about why they should subscribe to your list. Variate and A/B test your Optin’s CTA. Keeping same CTA across all Optins, decreases the effectiveness of the CTA as viewer blindness sets in, due to seeing it again and again. We will be looking at both these areas, as to where and how you should place your optin forms in them. Also we will be having a look at how to place Pop-up Optin forms, which are unlike traditional forms and demand immediate user attention via pop-up. About me page – This page of all blogs has sizable amount of traffic. Always place at least one optin form on your About Me Page. If you have a lengthy page, you can place 2-3 optin forms spread across the page. Within Post – Insert the form within long post. Keep this form simple, so that it does not distract much from the post. End of Post – Add form at end of the post. When a reader has read the post till the end, he/she is engaged with your website, and hence their likelihood of subscribing is significantly higher. Thank you page for Commenters – Add plugin to lead your blog commenters to thank you page – On this page,thank them for commenting on your blog, and remind them of the advantages of subscribing to your blog. On this page include a Optin form as well. A nifty plugin ‘Comment Redirect Plugin’ will help you with the redirect. Add it everywhere – Show subscription form to commenters, downloaders, leads, all those who have been engaged with your site, or shown interest in it. Blog Header – Place Optin form in the blog header. Header is a prominent place, which can easily capture attention of your readers. Sidebar of blog – If you have a sidebar on your blog, add an optin form to that. Keep it right below your about me box, but ensure that it stays above the fold. Footer of site – Add an Optin form to the footer of your website. Traditional Footer Opt in is displayed to the user when they reach at the end of the site, since many users never go down till the end of the site, this opt-in usually has low conversion rate. Here you can experiment with Sticky Opt-ins, which will be displayed to the viewer irrespective of where the viewer is on the page. While sticky opt-ins ensure that viewers see it, it does consume important screen space on your blog. This can affect the viewer's quality of experience. So make sure to monitor this opt-in's affect on other metrics of your blog closely. Top of your site – Hello Bar/ Many Contacts/ Viper Bar all these work well for most bloggers. Using this you can encourage users to sign up for blog update, offer them incentives in form of free e book, pdf download etc, or direct the users to any specific landing page of your choice. Set them to display after the user has been on the site for at least 30 seconds. Reader engagement should be established before popup is displayed. Do not over do pop up's, readers often complain that too many pop up's hamper the reading experience. For pop-ups OptinMonster is the best bet. Exit Pop -up are displayed when the viewer is about to exit your blog. These have been proven to be quite effective in gathering new subscribers. Beware that offering any incentive in form of free download/ebook etc in these pop-ups can be harmful in longer run. Because people who did not find your blog engaging enough to subscribe earlier might just subscribe in exit pop up for the freebie but will later unsubscribe. 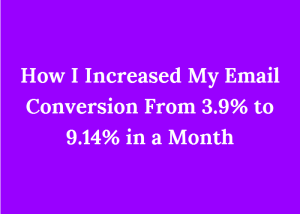 This can lead to increased unsubscribe rate for your email list. How they are affecting the blog's overall performance and user experience. So how can you do this, lets have a look at it below. The best way to test Optin Forms is conducting regular A/B or Split Testing for your optin forms. A/B testing involves testing two or more different variants of anything. You need to apply this testing to every aspect of your optin form. Right from the design elements to the placement. Create variants of everything and test which optin form proves to be most effective in getting subscribers. Within Google Analytic, you can setup your sign up as a goal and track user behavior for that goal.This tracking will help you decipher two things. One – which of your content performs most goal conversion. Once you have identified this content, you can work on generating more similar content. Also you can package this content using different mediums like images, video etc; to push it further. Two – which source brings in most goal conversion. Once you have identified the most productive source of audience you can work on increasing audience from there. You might be getting maximum traffic from Social media, but your most converting traffic might be that of Google. So track and decipher the traffic sources so that you can maximize goal conversion. Average Time Spent on blog, this is an important metric for you blog, and make sure that your optin forms do not impact this adversely. Bounce Rate, has been found to increase due to certain optin forms, especially pop up's. Monitor this closely and tweak your optin form accordingly. Pages per visit is another metric that although rarely but is found to be affected by the subscription optin forms. Do A/B testing to determine if simple or stand out opt in forms work best for your viewers. Different niches see different types of opt in forms work best for them. Keep your optin forms smart and slick. Ask minimal details. Shorter forms boost fill rate. Add testimonials to your Optin. They boosts credibility and fill rate of the form. Single/Double Opt in you need to test out what works for your blog. General wisdom is to use Double optin, for better converting subscribers. As opposed to this some blogs have tested and found that single Optin form work better for them; in terms of open rate, CTR, and even sales. So make sure you test what works best for your own blog. Create Optin forms which are different in content as well as style both. These different looking forms attracts readers attention; at the same time avoiding blindness amongst readers due to repeated views of same forms. Standard CTA button with text like submit, send, subscribe; see far lower CTR, as opposed to customized CTA like ‘Get your free report now', ‘join the tribe' etc. Once a reader has filled the Subscriber Optin form – Then take him/her to a dedicated landing page. Start out this page by thanking the reader for subscribing to your list; in case of double Optin forms explain the user with visuals about how to click on the confirmation link, add a brief introduction about what they can expect as a subscriber – from frequency of email to bonuses etc. Once the subscriber has clicked on the confirmation link, direct them to a dedicated Subscriber landing page. On this page use a good headline, thank the reader for choosing to subscribe to your mailing list, if you have offered any freebie at time of signup provide the download link to freebie and most importantly provide reader with what to read next suggestion. This page enable in creating engagement with the subscriber. 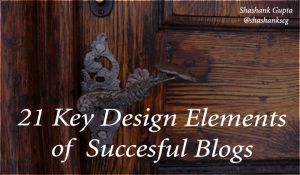 Every blog is unique and so is its list building strategy, so experiment and test and keep tweaking until you strike the right balance. As a thumb rule, your subscription list building strategy should be aggressive if your audience is not very tech savvy. Audience which is not internet savvy may not understand email subscription concept fully, and can easily miss out on your subscription forms. Hence for such audience you need to make your subscription form much more visible and aggressive. Explain them the benefits of subscribing to your blog and how they can do so, over and over again. As opposed to this if you are dealing with tech savvy audience like those in technology, Internet niche etc; go in for a subtle strategy. Internet savvy audience is more likely to know about email subscription, optin forms etc. So if you keep pushing them to subscribe they are more likely to walk off your blog. Encourage them but do not be overbearing.